Technologists are spoilt today by the seemingly endless selection of technical papers and standards available to them on the world-wide-web. Not so long ago, technologists relied on their own practical experience and inventive skills to solve technical problems. 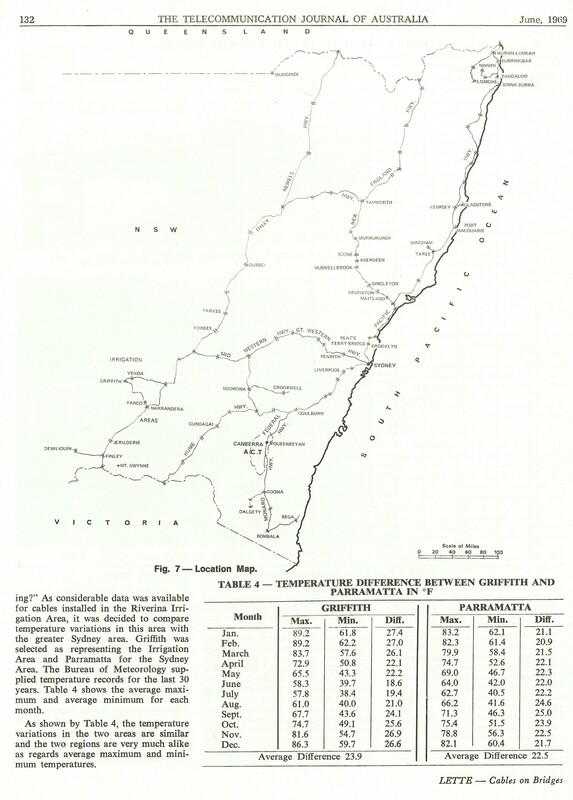 This was particularly the case for Australia, with the tyranny of distance and harsh environmental conditions. It forced the development of better equipment and processes to improve the reliability of the telecommunications network. 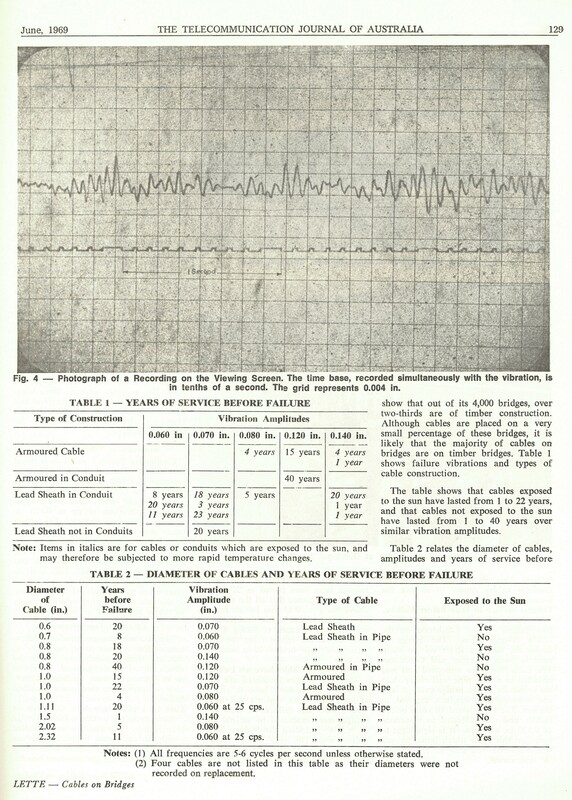 Where knowledge or experience were lacking, technologists devised experiments and undertook empirical measurements to separate fact from fiction and understand the extent of the challenge. 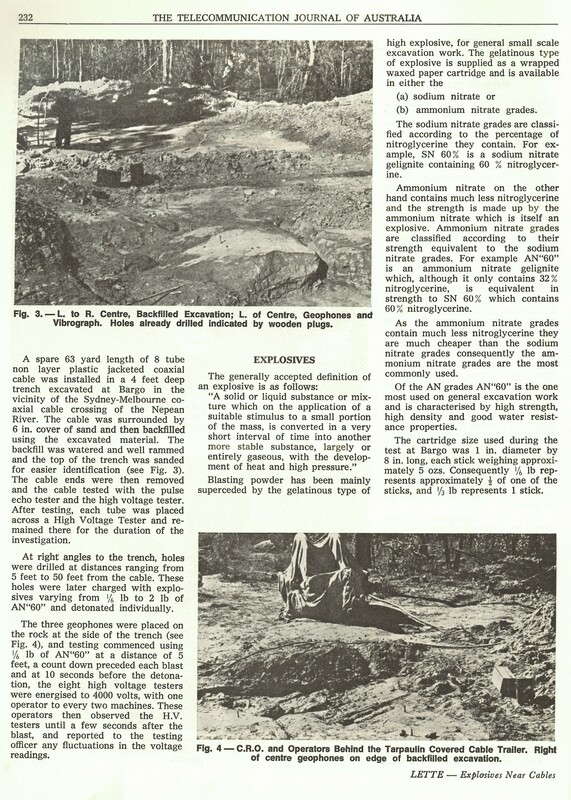 They then devised clever and cost-effective solutions which were regularly documented in this Journal and often received wider acknowledgment overseas. 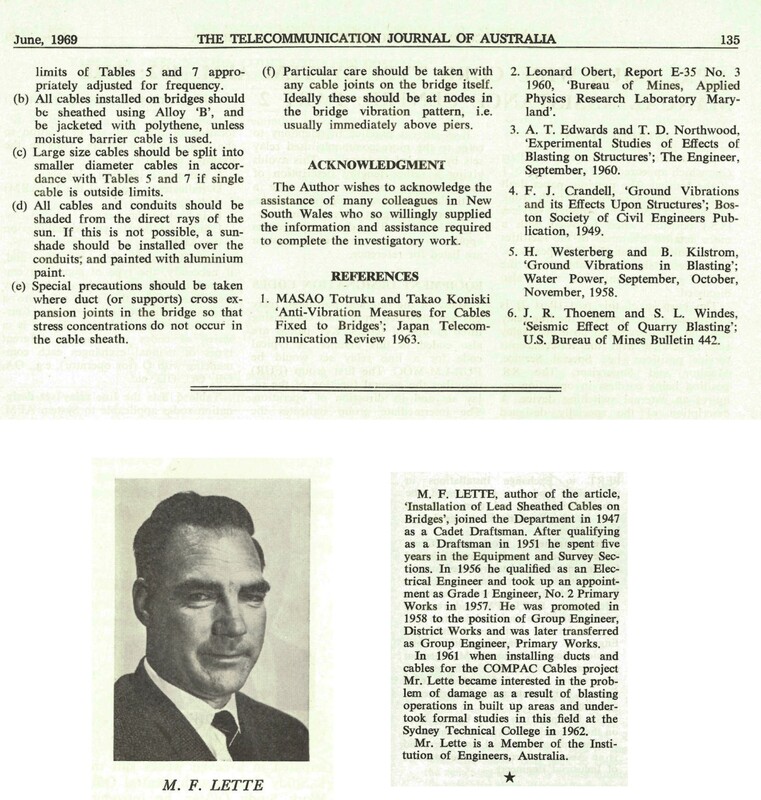 The two historic papers by M F Lette, Engineer Class 2, Primary Works, Post Master General?s Department from the Telecommunications Journal of Australia in June 1969 and October 1969 respectively are reproduced here. 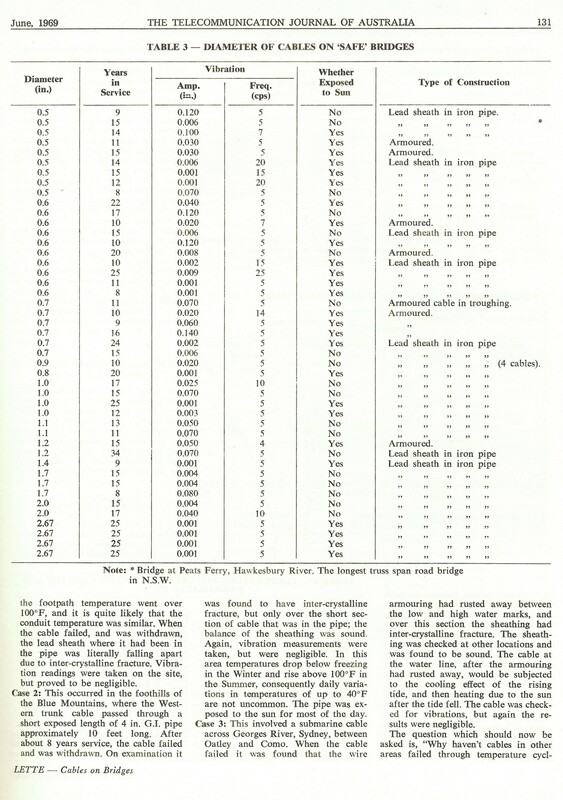 They provide details of experiments to determine the effects of vibration on telecommunication cable installations. 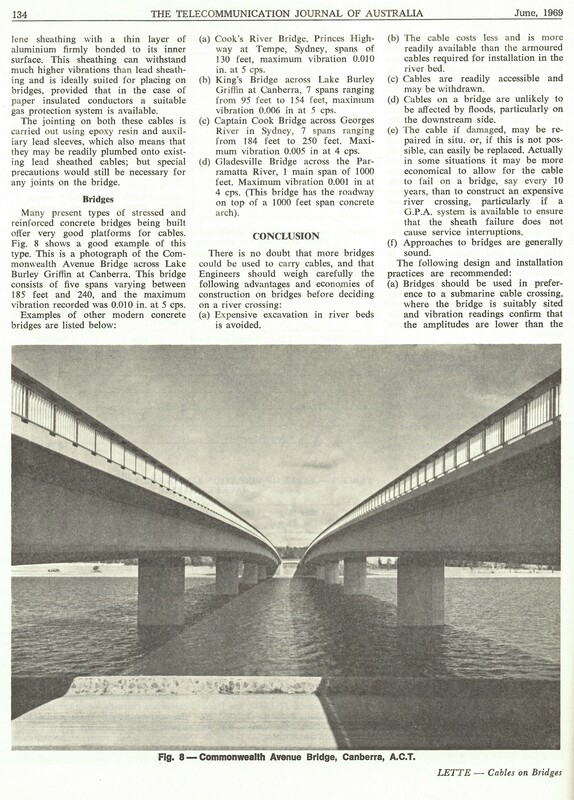 The first paper (Lette 1969a) tests whether the installation of cables across existing bridges (rather than the preferred but much more expensive option of submerged river crossings) is possible and can achieve the desired reliability. 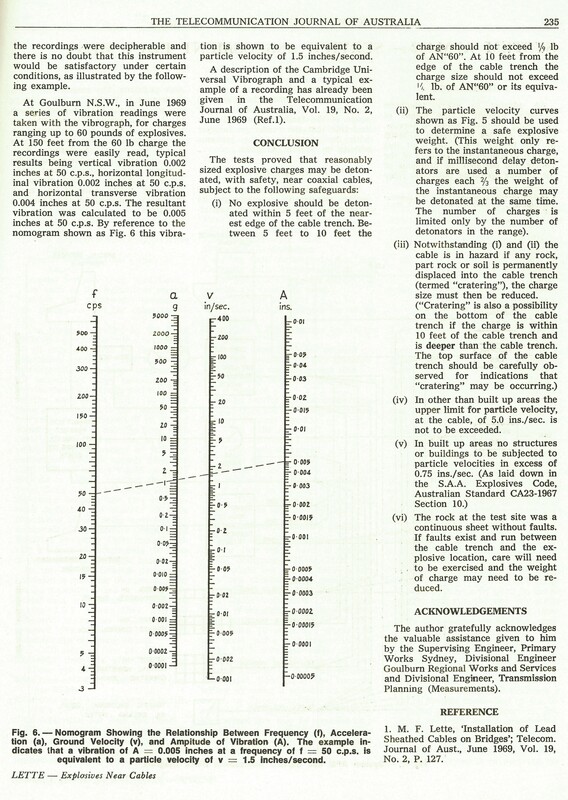 The second paper (Lette 1969b) tests whether the use of explosives near co-axial cables will affect their performance. 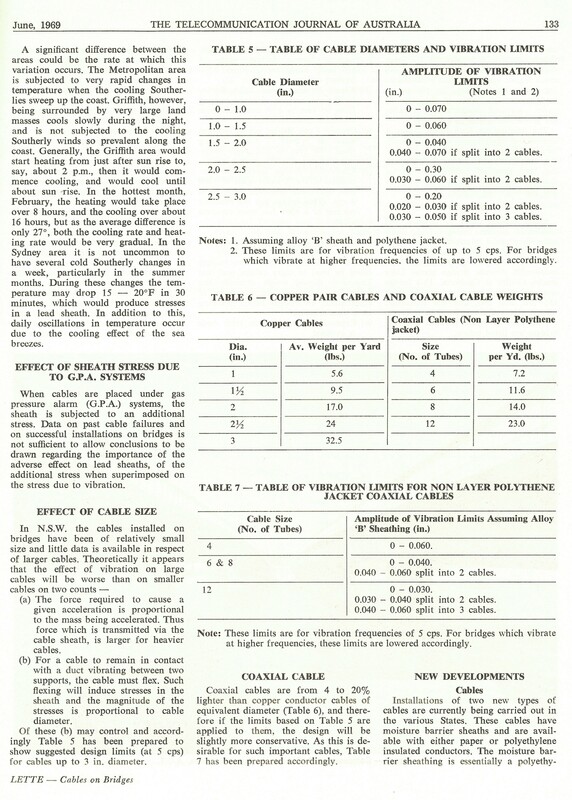 It appears that in 1969, there was significant reluctance to use existing bridges as a means of carrying cables across rivers because of vibration concerns. The author suspects that this reluctance is based on rumour and contributed to by bad installation practices. 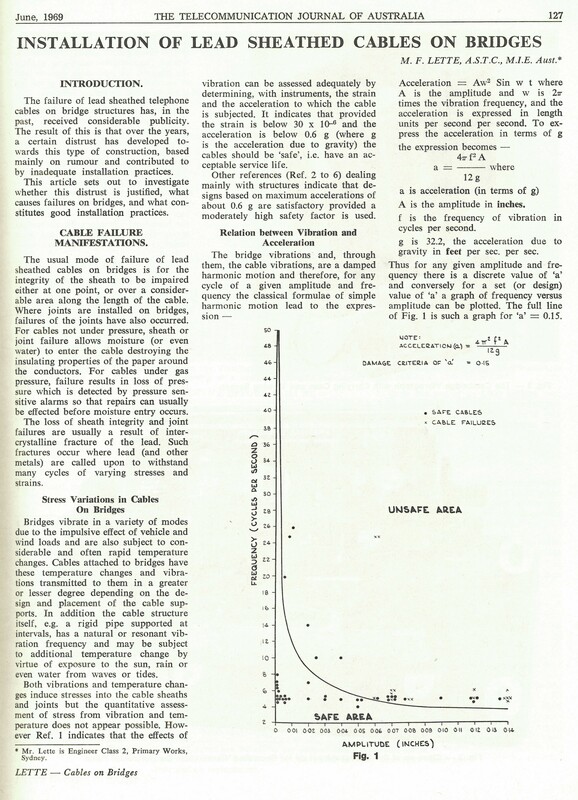 The author undertakes the measurement of vibrations at a number of bridges in NSW and correlates his findings against cable failure records. A number of recommendations are made but essentially cable crossings on bridges are much more economical and will be reliable, provided the vibration and exposure to temperature extremes is limited by proper installation. In the second paper, the author finds (contrary to expectations) that reasonably-sized explosive charges may be detonated close to co-axial cables with little or no effect on transmission. 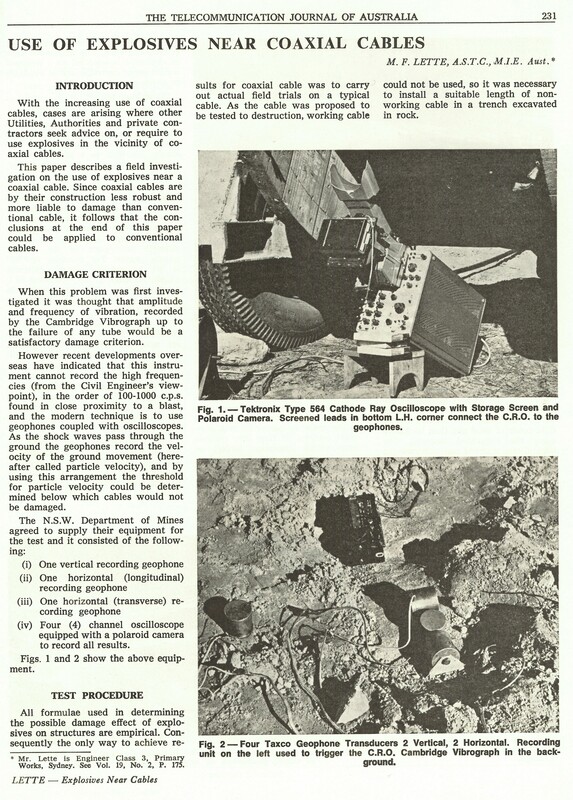 This is timely knowledge, as other Authorities are required to use explosives near telecommunication cables and the potential effects were a concern, but largely unknown. 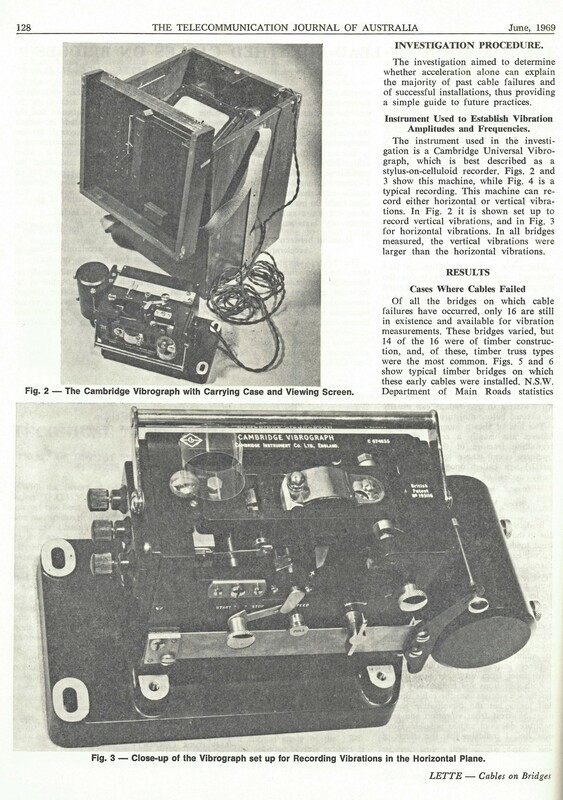 Both papers provide unique hands-on examples of the need for field measurements to verify reality and in these cases, to discredit some conventional wisdoms in the field of cable installation. 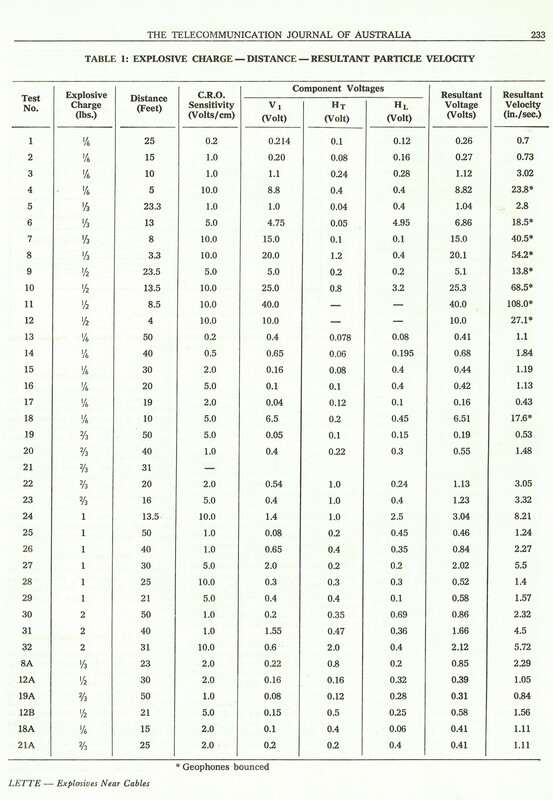 Lette M. F. 1969a. 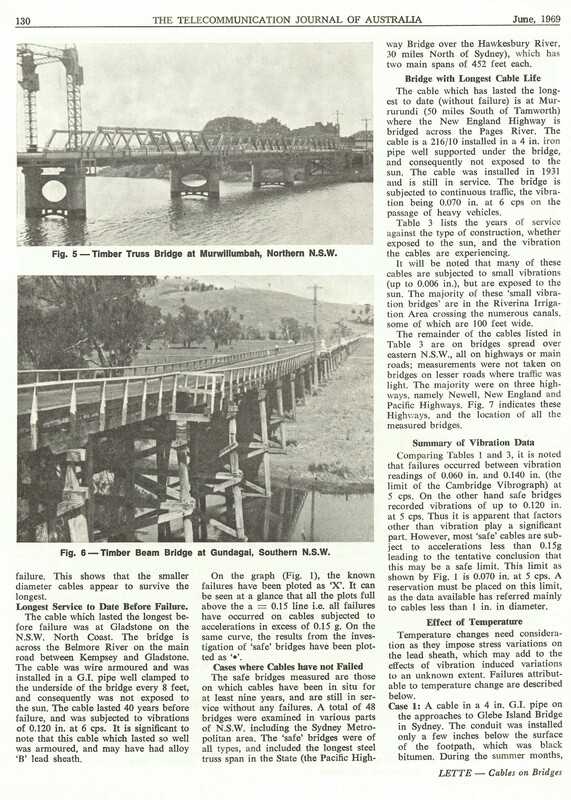 ?Installation of Lead Sheathed Cable on Bridges", Telecommunication Journal of Australia, June 1969, pages 127-135. Lette M. F. 1969b. 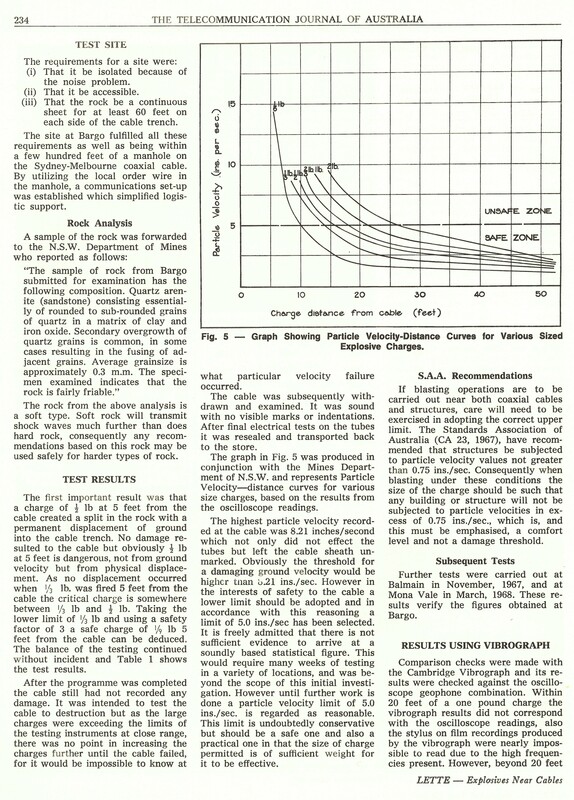 ?Use of Explosives near Co-axial Cables", Telecommunication Journal of Australia, October 1969, pages 231-235.